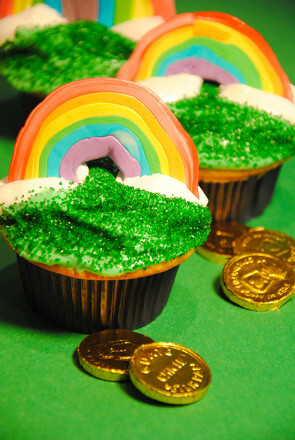 There's nothing like rainbows, glitter and gold to help celebrate St. Patrick's Day. 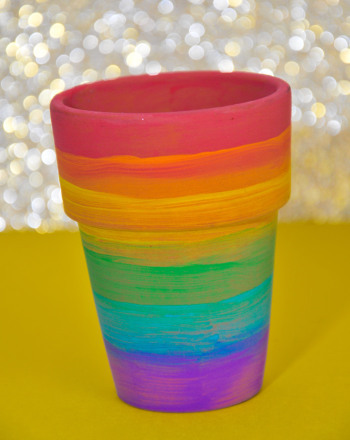 Your little one will have fun making this pot of gold craft that will help teach her the colors of the rainbow. 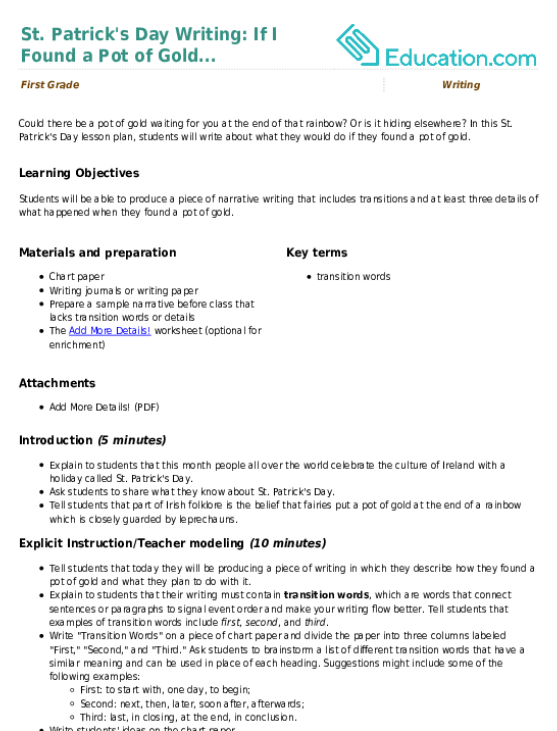 Once completed, it can easily be displayed on any doorknob or hook. Start off by folding the paper plate in half and opening it up so there is a crease in the middle. Help your child cut a half circle from the crease and along the inside of the ridge of the paper plate, creating the rainbow portion. Be sure not to cut through the ridge. About a ½ an inch under the midline of the plate have her cut a small triangle into each side creating the edges of what will become the pot. Then, have her colour the whole bottom portion black with a marker. Show her the colors of the rainbow in order, red, orange, yellow, green, blue, indigo (if you have a darker blue), and violet. If necessary, have her mark a stripe for each colour on both ends of the arch as a guideline to follow when she is coloring the rainbow. Once she’s finished, encourage her to use the markers to colour the rainbow. 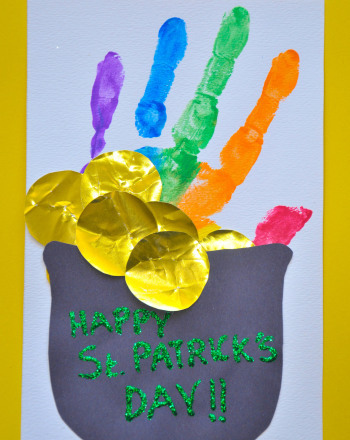 Let your child use the yellow construction paper to cut out a shape that resembles a pile of gold coins and have her adhere it to the back of the paper plate so that it peeks out over the black pot. Give her the green construction paper and help her draw a shamrock. 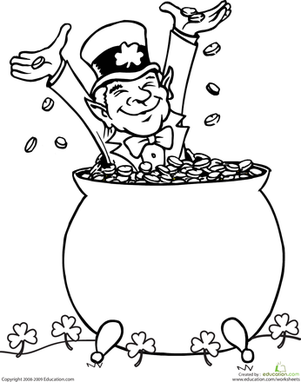 Cut the shamrock out and glue it in the centre of the pot of gold. Have her use the glue stick to apply glue across the shamrock and sprinkle some green glitter on top. 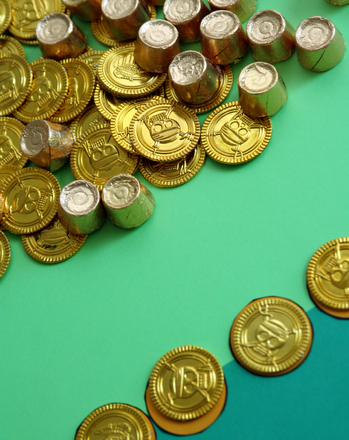 Finally, apply glue to the gold coins and sprinkle some gold glitter on top. Hang from a doorknob or any other fun place to display!